5L3BI – Activation of Baiyah Island, AF-111P – DATES OF ACTIVITY (tentatively) — October 31 to November 3 2017. DATES OF ACTIVITY (tentatively) — October 31 to November 3 2017. UPDATE – A new attempt at activating IOTA AF-111 – see here for full info. NOVEMBER 1, 2017 – After trying for 2 days we couldn’t make a landing. Way too dangerous. Boat almost capsized next to rock. The swell around the rock never eased. There’s lots more to say but not at this moment in time. We are as disappointed as you if not moreso. QRX for full update in a few days. 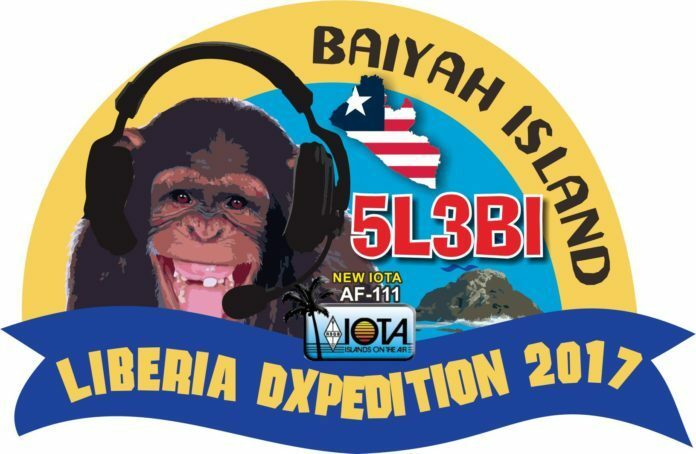 JANUARY 7, 2017 — Since June 2016, a dedicated team have been working tirelessly finding out information about the little known Baiyah and Flat islands of Liberia, IOTA group AF-111P. On New Years Day 2017, our man on the ground in Monrovia, Dickson EL2DT, went on a reconnaissance trip to get close and personal with the islands. There are two islands next to each other, namely Baiyah and Flat* islands. They are located in the Tarsue Chiefdom, Sanqine Statutory District, Sinoe County, Liberia. They can be seen from beach locations in Bame Town and Kranbi (at the border of Sinoe and Rivercess Counties). *There is also another Flat island within AF-111 group located some 65 km further south than Baiyah. The Flat island mentioned above has only been discovered through Dickson’s recce trip, and IOTA HQ will be informed of this on our return once we take more pictures and get exact coordinates. The history of one of these islands is that it’s a cultural sacrifices location for people in Tarsue Chiefdom. Baiyah island is known as the place where people in nearby villages usually carry out their traditional worship. As a result, no one normally goes there without proper arrangement and approval. Apart from that, there is a deep hiding history about Baiyah island. There is no one living on Baiyah island. It’s a good location and accessible for radio activities, albeit weather dependent. Dickson was very fortunate to meet and talk with elders and community leaders who’ve accepted our project and are willing to work with us in order to activate AF-111. DATES OF ACTIVITY (tentatively) — October 31 to November 3, 2017.